Discover the magic of nature this May when the Fairy Fair returns with its 21st fair. This year the fair will be held in the beautiful Bradmoor Woods, West Acre and features workshops, live music, entertainment and lots more for a magical day-out where families with young children can connect with nature. As well as simply enjoying the woods, there are bookable magical workshops including Fairy Crowns and Fairy Gardens (both about wildflowers), Elf Training and Fairy Training (both very active), Fairy Pets (about caterpillars) and our very own Fairyland Trust Wildlife Hospital where you can tend to some cuddly (toy) magical creatures. These Workshops most with a unique story, their own decorated tent or woodland setting, draw on authentic magical British nature folklore and natural history to discover interesting stuff about wild plants and animals. Plus, there is live music, food, drink and entertainment including story tellers, craft stalls and walkabout performers, as well as games, Maypole dancing, competitions and woodland trails and for the first time, the Actual Reality Arcade where you can try your hand at 10 iconic arcade games, but not in front of a screen - YOU make make the games come to life. Drop-in activities include Fairy Flowers, Bug Bling and Flutterbies and Fairy Houses. Following its great popularity at The Real Halloween last autumn, the No-new Plastic Fancy Dress Competition is returning for the Fair (free to enter and with prizes). For the first time we are very pleased to welcome the amazing and charming Mr Alexander who will give three free shows a day featuring traditional circus skills and tricks. Also new this year is the human-sized Actual Reality Arcade which allows you to play 10 iconic games, but not in front of a screen – YOU make the games come to life! That’s not all. Additional free entertainment includes all-day storytelling from our popular trio Cliff Easterbrook, Callum Mc Gowan and Mike Dodsworth, Maypole dancing, music from the bands including Penny Les and the Hal Wrayzer Combo as well as Stripy the giant Swallowtail Butterfly caterpillar, and our walkabout Wildflower Fairies, and the The Bee and May Bug. You can also visit the Pixie Post Office and colour in post cards and follow the Rainbow Trail through the woods to visit the Fairy King and Queen at home (free). Nearby you can also discover the Message Tree where you are encouraged leave a message for the fairies. Everyone is encouraged to bring a Watering Can for the finale with the king and Queen and if it’s not already decorated, you can join bling your watering can on site. Food and drink may be found at various catering stalls, plus at The Good Elf Licenced Pub, and the Corncockle Cafe. Stalls in the Fairy Market sell local and handmade crafts. A proportion of their takings goes to support the Fairyland Trust so please think do shop. We have no cash point on site but can offer cashback on your card at the entrance tent should you need it. 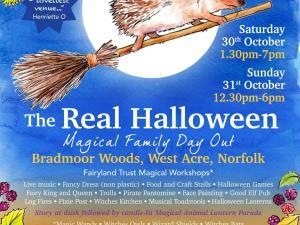 The Fairy Fair is a fundraising events for Norfolk conservation charity, The Fairyland Trust. Tier one early bird tickets in advance £7.50 per person. Family pass - admits 4 £28 / £34 at the gate.